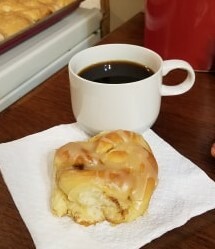 Cinnamon rolls are always a treat, especially for kids. And for adults. Well, they’re a treat for anybody! 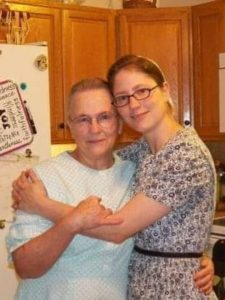 My friend Naomi is a mom of eight – six girls and two boys. Would you say that means plenty of help in the kitchen?! 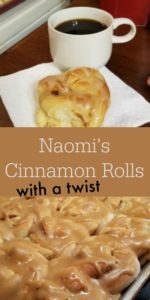 Naomi has a unique twist of a cinnamon roll, and she kindly offers her recipe and photos to help you learn how she makes her rolls. The idea of creating twisted knots came from her mother, Hettie Barnhart. She tired of the knob section in the center of a regular cinnamon roll poking up and needing to be squished down where it belongs. 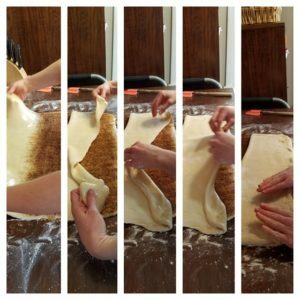 Hettie developed her own recipe after trying different ones. I appreciate Naomi’s willingness to share this tutorial with me – and with you. 2. 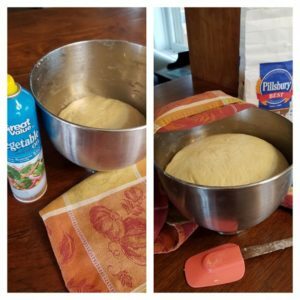 Combine water, yeast, and sugar. Stir until dissolved. Set aside. 3. Scald milk, then add instant potatoes, salt, sugar, and shortening. Stir until sugar is dissolved and shortening is melted. Cool to lukewarm, then combine with the yeast mixture. 4. Add bread flour and baking soda to the yeast mixture. 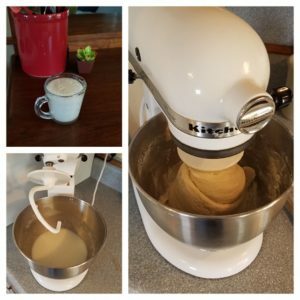 Stir and knead until smooth. Altitude and temperature affects the amount of flour needed, so you need to add enough flour until the dough moves away from the bowl. Be careful not to add too much or it will become stiff. 5. Lightly grease a large mixing bowl; place smooth dough ball in pan and turn dough over, greasing the top. Cover bowl and let dough rise until double. 8. Over half the surface (lengthwise) sprinkle brown sugar and cinnamon. You can spread it with your fingers if you want to. 9. Fold the other buttered half over the cinnamon sugar half. Press to remove any bubbles and to adhere both sides of dough to the cinnamon sugar mixture. 10. From the fold to the long edge, cut into 24 equal strips. Twist each strip, then tie into a “knot.” Step-by-step photos follow in the collage below. 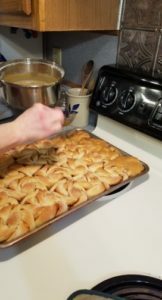 Arrange rolls on a large baking sheet. To watch how to do this, click on the video below at the end of this post. 11. Let rise again. Preheat oven to 350. 12. 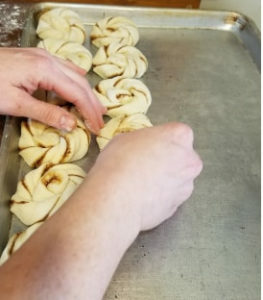 Bake for 15 – 20 minutes, just until golden brown and the center ones appear done. Frost with Quick Caramel Frosting. 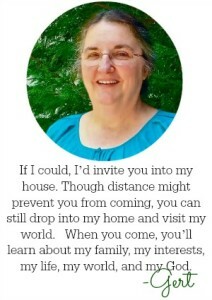 This recipe come from Mennonite Country-Style Recipes & Kitchen Secrets by Esther H. Shank. 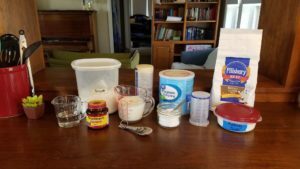 This recipe calls for 1/4 cup milk, and Naomi adds 1/3 cup milk. To watch Naomi’s demonstration of the “twist”, click on this video. 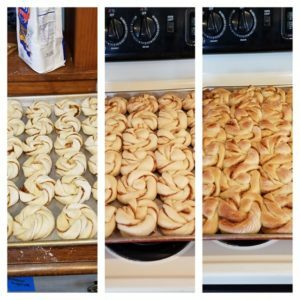 A delightful twist to cinnamon rolls! Combine milk, potato flakes, salt, and sugar until sugar is dissolved and shortening is melted. Add bread flour and baking soda to yeast mixture. If necessary, add more bread flour until the dough pulls away from the side of the bowl. 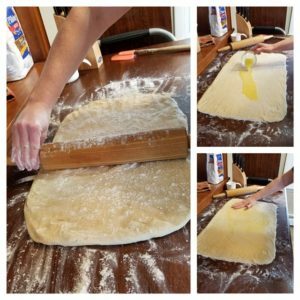 Do not add too much, or the dough will be too stiff for the rolls. Lightly grease large mixing bowl, place smooth dough ball in pan and lightly grease top. Cover bowl and let dough rise until double. 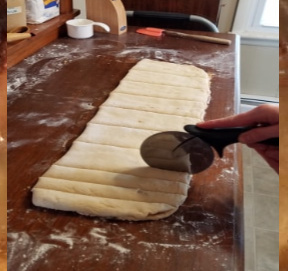 When the dough is double, flour surface and roll dough into large rectangle. Melt ¼ cup butter and spread over whole surface. 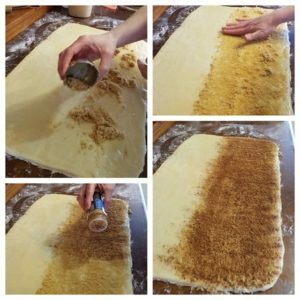 Over half of the surface, lengthwise, sprinkle brown sugar and cinnamon - spread with your fingers if you want to. Fold the other buttered half over the cinnamon sugar half. Press to remove any bubbles and to adhere both sides of dough to the cinnamon sugar mixture. From the fold to the long edge, cut into 24 equal strips. 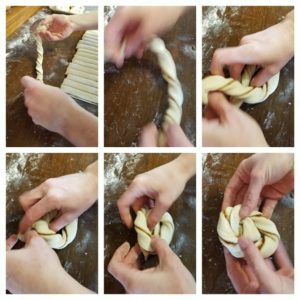 Twist each strip, then tie into a "knot." Arrange on large baking sheet. Preheat oven to 350. Bake for 15-20 minutes. FROSTING: Melt butter and sugar and boil for 2 minutes. Add milk and heat just until boiling. Remove from heat and cool slightly. Stir in powdered sugar until smooth.